Answers to your questions about our process. Here are some questions we get asked a lot, and some answers we think you should know. What is that stuff on my roof? OK – The technical term for it is Gloeocapsa Magma. Now everyone wants to go all technical, but the three things that are on your roof are algae (the black streaks), moss, and lichens (the stuff growing on the trees in your yard). Where did it come from? Does it spread? First, some misconceptions. It does NOT come from jet fuel and it does NOT spread. It isn’t some fungus that is invading northeast Ohio from the South. If you have it on one side of your roof and not on the other, the side without is not going to get it from the side that has it. The reason this stuff is growing on your roof is simple. Algae, moss, lichen spores are always in the air, but they will only take hold and grow in a hospitable environment. The north side of your roof just happens to be that environment. Similar to the reasons why moss grows on the north side of trees, the environment on your roof is a byproduct of the tilt of the earth. When the sun goes through the sky, especially in winter, the northern part of your roof is shaded for most of the day. This shade allows water to accumulate and provides the moist environment for algae and moss to grow. You might also see stuff growing where you have downspouts pouring onto the house or where trees overhang the house and prevent the sun from drying the roof. Again, the roof stays wet and stuff grows. That is also the same reason why it doesn’t spread. Without the environment, no growth. Just look around your house and in your yard. Find a shaded area and you’ll probably find moss. But it isn’t in the areas that get sun. The south and east sides get the most sun and it is usually unlikely that they will have algae or moss growth unless trees are providing shade. There is one exception and I can’t explain it. Light grey roofs get growth all over. The south and east sides usually take longer for the growth to take hold, but from looking at hundreds and maybe even thousands of roofs, this just seems to be the case. As such, when we clean a light grey roof, we recommend a preventative spray for and sides that may have no stains or with just small beginning stains. There are 2 different ways you can clean your roof, bleach or pressure. If someone is “soft washing” your roof, they are using bleach. Both methods work, but have advantages and disadvantages. For some reason, the bleach guys and the pressure guys have decided to create a war over their individual method. Personally, I have used both and seen the results from both for years. Therefore rather than trying to argue for one method over the other, I will explain the difference and let you, the consumer, decide what is right for you. Most roof cleaners who use pressure use one of the following products. Oxygen based cleaners – When we use pressure, this is the type of cleaner we use most often. To put it in very generic terms, it is like OxyClean. Like bleach, it is an oxidizer, but it packs considerably less punch which is why it needs to be rinsed. However, since it isn’t as strong, it doesn’t do any damage to siding or plants even with direct contact. Sodium Hydroxide – This basically turns your algae to soap and you rinse it off. It is a very effective method and properly done will remove algae and black streaks. I do not use this method, but I know other roof cleaners who have used it for years and it works. Like an oxygen based cleaner, it must be rinsed. The difference main difference between these products and bleach is that they are not as strong and have to be rinsed. The problem with rinsing is that it takes extra time and that time is money. That means a greater cost for you. The rinse process is done with low power pressure washers using wide angle tips with large orfices for a greater water to pressure ratio. The rinse WILL NOT damage your roof. The advantage to using these products and rinsing is that the roof is done when we leave and you don’t have to wait for rain to finish the job. If a roof cleaner isn’t using pressure, they are using bleach. Each roof cleaner has their own proprietary mixture for the bleach and different chemicals they mix into the bleach, but the main ingredient in any soft wash mix is bleach. Bleach – This method requires one man on the ground to keep everything wet and one man on the roof to spray the cleaner and rinse the algae. The whole process is done with a hose and no pressure is applied to the roof. In a nutshell, the difference in using bleach is that it is a more technical process. You have to control your mix correctly and the application process must be done correctly. Since you’re using a stronger product, misapplication can result in problems. If the man on the ground doesn’t keep everything properly wet, shrubs and trees can get chemical burns and new growth can be killed. Also, improper watering from the ground can lead to streaking of the gutters or siding. Obviously, you don’t stay in business long if you burn plants and streak gutters, but it will happen every once in a while when you’re cleaning hundreds of roofs a year. The other problem with bleach is that there is no rinse process, since you are just applying a treatment. This lack of rinsing can lead to an odd looking roof until you get a decent rain. Brown dead spots, white spots from the residue of the bleach breaking down, and dead lichens and moss can all remain on your roof. Let me explain each. Dead Organic Growth – When the roof is treated, you are killing the organic growth on the roof. Even though that growth dies, is does not get rinsed until the rain does it’s thing. Bleach Residue – When bleach breaks down, one of the components is salt. This is also the primary reason that you need to keep plants watered as salt doesn’t get along with plants very well. If your roof cleaner’s mix is a little off or it the overspray it a bit, you can end up with residual salt deposits on the roof. Again, these will go away as soon as it rains. 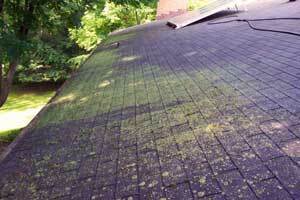 Lichens and Moss – These are one of the more sticky components to a roof cleaning. If you use bleach to clean your roof, you will kill all the moss and lichens. 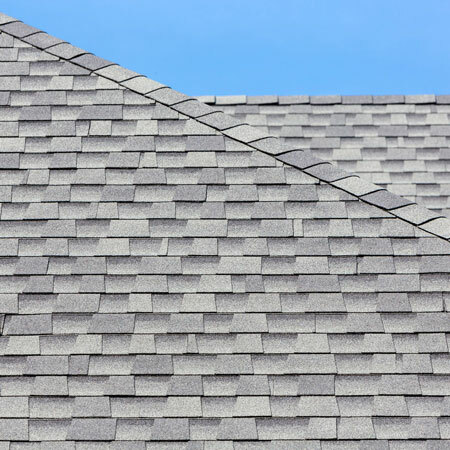 However, these will not fall of your roof immediately and sometimes may take 2-3 months to come off. Lichens and Moss have a thicker root system than the algae growing on your roof. This root system sets itself directly into the granules of the shingles. When the roof is treated, these growths die, but it takes a while for the root system to disintegrate and let go of the roof. 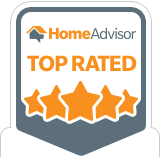 I use bleach for most of my roof cleaning jobs because frankly, it is a cheaper method and I feel my chemical mix allows me to offer my two year guarantee without worries. However, if you need immediate results from your cleaning and can’t wait for the rain to rinse the roof, I can use the rinse process to give you the immediate results. Do you have a product that can seal my roof and prevent the algae from coming back? There are companies out there that are selling a “sealer” for your roof which will prevent the algae from coming back. To be blunt, these companies are either lying or they are stupid. Let me explain. Roof cleaning is a huge business around the country, particularly in the south where it is humid and algae grows on all sides of the roof. Every roof cleaner and the shingle manufacturers themselves have all been looking for the magic sealer for years. If the shingle manufacturers themselves haven’t found it with their huge research and development departments, why would anyone think that some local company has found the magic product. If someone actually invents a sealer that works for 5-10 years, they will have a product with a multi-million dollar market. So if you’re being sold a sealer, ask them why they aren’t selling it to the shingle manufacturers and the roof cleaners around the country. Like I said, you aren’t going to develop a multi-million dollar product and then sell it to local customers in Ohio. Do you clean gutters or wash houses? Yes, we clean gutters and wash houses, but we generally offer them as part of a roof cleaning package and not as stand alone products. However, we try to accommodate everyone so give us a call or request those services with your quote. What Cities and Counties do you service? Areas we service include: Akron, Aurora, Bath, Barberton, Brecksville, Chagrin Falls, Copley, Cuyahoga Falls, Fairlawn, Green, Hudson, Kent, Medina, Monroe Falls, North Canton, Norton, Orange, Peninsula, Portage Lakes, Reminderville, Richfield, Solon, Stow, Streetsboro, Tallmadge, Twinsburg and more!